Week 6 – The Office Reveal! Today, I am switching gears to one of the main components of the room and that is an antique desk makeover with chalk paint. Remember this highly loved desk? It belonged to my father-in-law and was the desk (and chair) that he sat behind when my husband was growing up. I remember the day they called to say they were throwing it out. My husband’s eyes lit up as he choked out an emphatic “Of course I want it!” In fact, during the entire 5 hour drive home, he spoke of what this antique desk symbolized for him. Manly. Respect. Authority. Winston Churchill and a Scotch Cabinet. This antique desk meant so much to him that I about fell over in shock when he mentioned that he wanted me to paint it. I dropped all of my plans for the ORC challenge and decided to do his office just so he didn’t have time to change his mind about the desk makeover. Anyways, the desk had aged very well, but I wanted to update it just a bit to fit in the new office. I knew I wanted a chalky finish paint and I have worked with several brands but I was hoping for something a little different for this desk. I love the “no prep” aspect of chalk based paint. Being my over-achiever self, I can’t bring myself to testing the limits of that theory. I did a good sanding and primed the areas that were veneered or clear coated like the inside leg area of the desk. I had a very specific gray in mind that I wanted for this masculine, stoic yet patriotic office space. While I searched, I found Prairie Colors Chalky Finish Paints. Unfortunately they have since closed up shop. However, I have since found Fusion Minerals paint and I love it. Although I have not, it can be waxed or sealed with a polycrylic. However, Fusion Minerals cures to a durable finish, so waxing is a choice, not a necessity. The closest match to this color would be Soap Stone. I used a microfiber roller on the drawer fronts and painted everything else with a brush. You will not find a brush stroke on this baby. One of the things I love about this paint is that it has a noticeably longer working time than other brands of chalky finish paint. It still dries even and quickly but the paint gives you a little longer to perfect the finish. Of course, if you are using a dark wax or want a more shabby look, you can get that as well. I loved the sophistication that the gray exuded so I decided not to distress this particular piece. Something about it just whispers regal and sophisticated to me. The top was actually in great shape and only the molding around the top required some refinishing. 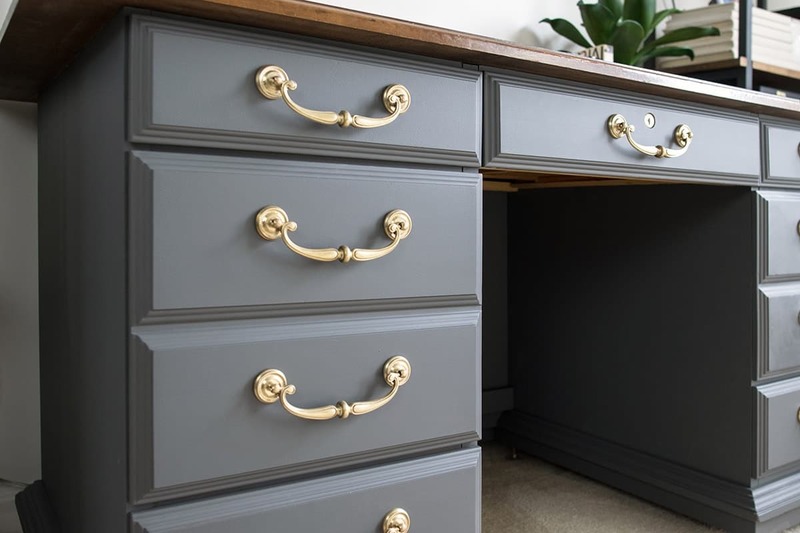 I wanted to avoid painting the top, but I was very concerned that the desk would feel too busy with the gray, the wood top, and the brass knobs. It wasn’t until I put the brass hardware on that I knew it was perfect. 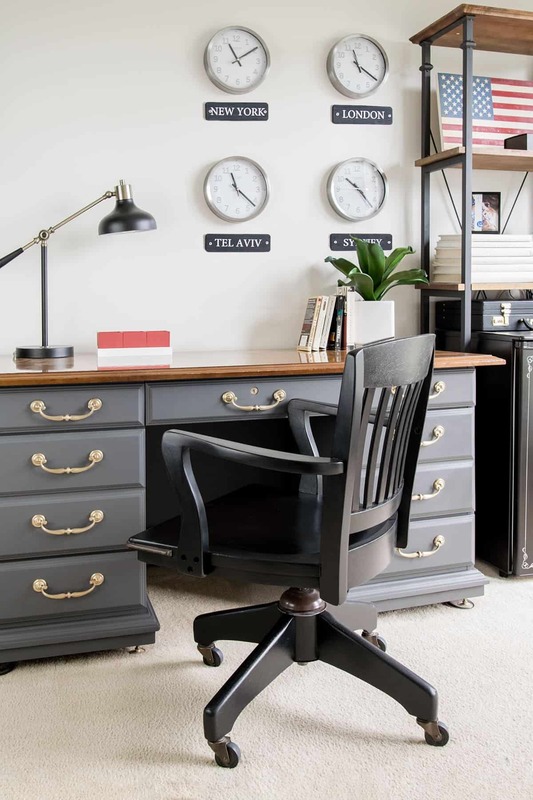 The hardware added to the industrial, military inspired style of the office. I don’t think it could be more perfect. Seriously, I kept walking into the office over and over just so I could see it again. And each time, I was like one of those TV room makeover recipients with the crazy happy reactions. A painted fridge makeover you won’t believe! And what did the hubby think? To be honest, he likes it but he is still getting used to the change. He loves the style. 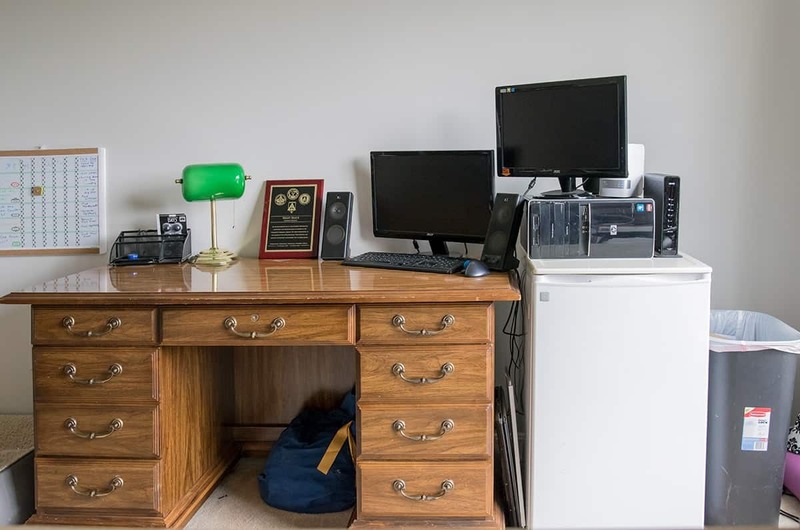 However, this is a desk he has seen the same way for 30 years so it is a bit sentimental and bitter-sweet for him. Next week is the last week before the big reveal! I still have some small accessories and the international clock wall art to finish but we are getting so close to the end. Until next time, I would love to hear what you think. Let me know in the comments below. Oh, it delights me that you see the inspiration! The dress uniforms were exactly how I got the idea. I truly love the paint. I just finished painting a different dresser for my son’s room. I had started that dresser long before this office, but all I kept thinking last week was how much easier to work with your Prairie Colors Paint was. I guarantee you will be seeing more projects on this site with your line and I already have plans after I finish his bedroom set. You should be proud to have such a quality product. I love a good furniture transformation. Your desk turned out great! That desk is stunning! Fantastic job! Whoa. Love the color on the updated desk! The finish looks so smooth and the brass hardware really pops. Wonderful job! Thanks so much for sharing your creativity at the The DIY Collective! Please join us this week to show off your latest project! Wow! This desk looks so different, Rachel. Love how you gave it a makeover. Thanks for sharing how you tackled this project. Love how it turned out! It really changes the whole look of the space. This is GORGEOUS! You did a really amazing job! I want to try this paint brand, too! Bre, I’d be happy to send you a sample of our Prairie Colors Chalk Finish Paint. Just use the contact form at prairiecolors.com and let me know what you’d like! Great job on the desk!! The desk is absolutely beautiful! I remember it from before, but you’ve made it manly and gorgeous all at once. Great work! That desk is absolutely gorgeous! You did an amazing job. Need to pin this because I am in love with the color you chose! Awww, that is beautifully sweet, Maria. You just can’t buy something to replace a piece of furniture with so much history. I appreciate that I was able to give it new life. I love the refinishing project you did on the desk. I am having difficulty finding any of the Web sites you have linked above. Has the company changed it’s name or perhaps been purchased by another supplier? Please advise in regard to purchasing the paint referenced in this project. Hi Darrin. Actually, it’s funny that you wrote me today as I am in the middle of working on updating these old furniture project posts to make sure the information is current. So thank you! You are correct that the paint company I used for this desk closed (bummer!). However, I have done many painting projects over the years and my favorite matte furniture paint today is called Fusion Mineral. You can learn about them HERE or check out our other furniture projects to see why I use them. Also, I buy Fusion from Lost and Found Decor since it’s a bit cheaper than Etsy. If you are looking for a color match, Soap Stone would probably be the closest. Let me know if you have any more questions.